I've been blogging since 2013 and a few reasons I stopped working on my blogs because lack of the internet (I remember, I don't have stable internet. I've been blogging since 2013 and a few reasons I stopped working on my blogs because lack of the internet (I remember, I don't have a stable internet connection these days and my father is an electrician and he didn't pay PKR2000 for an unstable Internet connection) and I came back in 2016 on the Blogger platform. And I work a lot on Blogger now I have 5-7 Sites on different niches. Over time, as my blog grew to thousands of page views and earned thousands of dollars, I heard over and over "Why haven't you moved to Wordpress?" and "You will never be a 'big' blogger or be taken seriously if you stay on Blogger." One of my friends ask me why not to merge your blog to WordPress? Because he is just started his journey on blogger and always ask me about WordPress and I always say "Faltu, Paise hain to Hosting lo aur karlo". I replied: There is no difference between the two. He said: The content is instantly indexed in WordPress! I replied: Its matter of work if you regularly post unique content on your blog then it will definitely get indexed by Google Crawlers. And many other peoples ask me the same thing. But based on my own success, I wasn't convinced. So I did my own research and stopped paying attention to rumors and other bloggers. And this is what I realized: Blogger blogs can be customized and optimized for increased search traffic, revenue generation and viewability. They are a completely viable blogging option. I'm actually not even sure why this can be a myth. Sure, there are several blogs that keep the standard blogger template, however, that is also true with other blogging platforms. Customization is all about how much work you're willing to put into your template. Blogger offers various 'outside of the box' templates, and all for FREE! It isn't' about how much money you spend. And there are also premium themes you can get from Themeforest. SEO optimization works exactly the same method with Blogspot-hosted blogs as it does with self-hosted blogs on the Wordpress platform. Google has actually installed simply customizable ways to optimize SEO without expensive plug-ins or in-depth knowledge of HTML. It is also common knowledge that G+ engagement is weighted heavily in Google Search Rankings and helps build SEO. Did you know that when a Blogger blog is linked with a G+ profile, blog views also count as G+ profile views? Additionally, if host your photos through Google, your image SEO is amplified via your Google plus galleries by amplifying a Google plus profile's weight within the search rankings. Only Blogspot-hosted blogs have this benefit. All those Blogger linked Google plus pages with millions of page views have a CLEAR advantage in Google search results. Google may actually PREFER Blogger blogs because of Google+. Once again, this myth is pretty random however simply dispelled. Many large blogs still use the Blogger platform and they make plenty of money! You can search more Blogspot blogs by visiting this link Blogspot search. For example, Unbelievable-Facts (a blogger hosted blog) has had over 700 million visitors since it 1st hit the web, all without leaving Blogger. The biggest downside of a blogger is lack of support for anyone who isn't very tech savvy. Most bloggers on Blogger either begin with programming skills or they need to be self-taught. I am the latter, and I remember how frustrating it was to learn things on Blogger that should have been straight forward. That is why I'm offering blog support specifically for the Blogger platform. It will be a great platform (maybe even superior to Wordpress) once you know how to use it. And for that. I'm here to help! Custom Permalink Structure: WordPress offers a better structure. In blogger, you lose your URL ranking because of silly date and year in between. WordPress SEO by Yoast or All In One SEO can also do the task with keywords in minutes! Do you know that if you change post URL after publishing in WordPress then it automatically redirects 301 redirections to a new one? WordPress has a template 404.php which you can code in your way! Blogger Permalinks are more robust than WordPress because those dates are always preferred. Check out BBC Blog and they also have those dates in their permalinks. Dates actually help users to search through the content and let them know when the article was published. If you need plugins to increase your SEO Score than, I'm afraid you don't know how to write quality content. Everything has his pros and cons. You can always redirect your URLs to any page in Blogger. You need to edit 404.php. In Blogger, we only need to copy and paste and the 404 page is ready. Blogger is not that bad, as peoples are rating it. You see, the blog which you are currently on is hosted at Blogger and still, it is way better than many of WordPress blogs. Blogger has better Security, Zero downtime, Great SEO Options, It is in the Cloud. So I think these stuff are enough to rated Blogger as the revolutionizing Blogging platform. Blogger is on the cloud, I bet no one can hack it. Thanks, Google for your awesome services and I hope you give us a support system for Blogger.com! Please UPDATE Blogger regularly and add new things to it so we'll proudly say "We're Google Blogger". We value your feedback, so if you have something to share then leave your important comment below. If you are enjoying our contents, please leave us a rating and a review on our facebook page and join our facebook group. 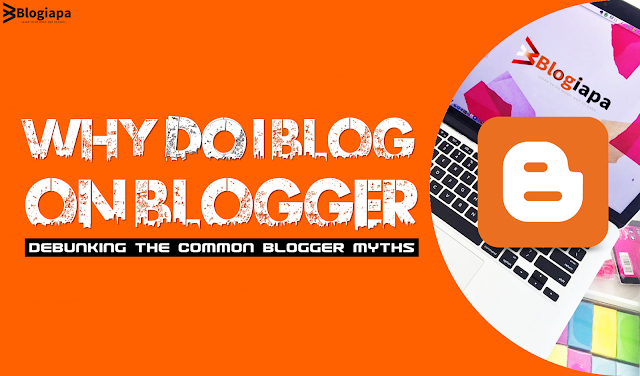 Blogger Did You Know ? My pleasure, yes you can do anything on blogger and Google is working on it maybe we see something new in the upcoming time.